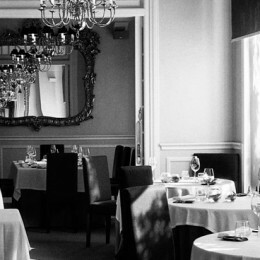 El Club Allard is one of the top restaurants in Madrid, born in 1998 as a private club and opened to the public five years later. During this period it became a prestigious fine dining restaurant awarded with two Michelin stars. The Club Allard’s facilities are located in the historic building of “Casa Gallardo”, the magnificent palace a few meters from Piazza di Spagna, icon of the modernist style of the early ‘900. The 27th of January at 18:00 in SALA 1 the CEO of Tartuflanghe PAOLO MONTANARO and the chef GIUSEPPE IANNOTTI will present a fascinating lesson titled “Truffle mysteries”, introducing new languages and vanguard gastronomy through culinary and technological experimentation. The legacy between the company, the Langhe region and the Chefs made Tartuflanghe a landmark both nationally and internationally in fine foods. A vision towards the future while basing its savoir-faire on tradition and culture, connects Tartuflanghe to a terroir that has been recognized as a World Heritage site. Present and future of an undisputed tradition, a unique craftsmanship. Gastrofestival, it is an initiative from Madrid Fusìon: 2 week of events and activities around Madrid to give an experience 360° around food and its nuances. 400 premises will be the live hosting places for a cultural, fashion and artistic agenda with no comparison. This 7th edition will be endorsed by the claim “Còmete Madrid”! The Ritz-Carlton Hotel is located from the 102nd to the 118th floor of the International Commerce Centre in Hong Kong. It is the “highest “hotel of the world and has 312 rooms available with a breath-taking panorama, six restaurants and a Lounge bar. One of the most acclaimed restaurant is Tosca, where is possible to relieve the passion and enchantment of one of the world’s most beloved operas through the Italian inspired cuisine of Chef Pino Lavarra. High ceilings, stately fountains and majestic chandeliers lend a Romanesque feeling to this stylish dining destination. The innovative Italian menu features improved favorites and thrilling interpretations of the region’s notable cuisine, and an open kitchen allows guests an even more theatrical dining experience. The guests will be enchanted by the unique breath-taking view of the Hong Kong island and by the Chef Pino Lavarra’s extraordinary cuisine. Over 166 meters high with 38 floors and 25 very fast lifts, theIntesa Sanpaolo skyscraper, a jewel of architecture and technology designed by architect Renzo Piano, has created new prospects for the contemporary urban landscape of Turin. It offers environmental sustainability, redesigned public spaces, and a gigantic suspended greenhouse. This garden with a unique view houses the Piano35 restaurant, modern and simple with a beating heart of creativity, elegance and practicality. It is a pioneering project for this top Italian restaurant, where its unique atmosphere merges into an impromptu landscape that gives way to the feeling of a lucid bewilderment, with your head in the clouds. It’s a gastronomic experience that involves all of the senses. The Kresios restaurant in the nice countryside of Telese Terme is the ideal place for business meeting, romantic dinner, thanks to its two rooms and a private room. 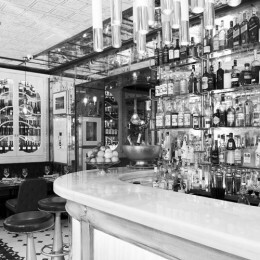 The restaurant offers 40 seats, in a relaxing atmosphere made with a white grand piano. From Tuesday to Sunday the chef Giuseppe Iannotti works with his staff in an enjoyable open kitchen to satisfy the gourmet customers. Is also possible to organize events, aperitifs and business breakfast. In the Kresios bistrot the high cuisine meets the street food, always featured by excellent raw materials and artisanal handmade quality. The restaurant offers the possibility to spend the night there: are available two rooms and two modern an enjoyable suites. Tartuflanghe company offers more than 100 different recipes: a big variety of Italian specialities and truffle products made through an accurate selection of raw materials. The quality is guaranteed by the high professional competence used during the production, the respect of tradition and the handcrafted methods along with technology and innovation. Tartuflanghe products are to be found in the best gourmet shops and delicatessen in Italy and in the whole world. In Italian, ‘gaia’ means happy and joyful, and with that, this upscale restaurant in Sheung Wan guarantees to impress the savviest diners by offering a delightful experience whether it’d be lunch or dinner. For more than a decade, Gaia has been committed to serving enjoyable Italian fare. Known for its regional Italian classics, fabulous selection of boutique Italian wines and alfresco seating, it continuously wows guests with its overall dining experience. With its recent facelift in late 2012, Gaia Ristorante sets a new standard in glamour and puts the restaurant in the heart of Hong Kong’s culinary map. 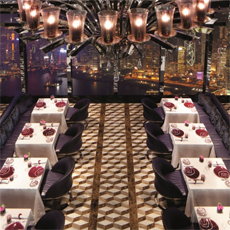 Award-winning Hong Kong architects Leigh & Orange and designer Hugh Zimmern have created an ultraglamorous dining setting which embraces a bright and lively atmosphere during daytime and transforms into a sophisticated dinner setting at night. The new interior is subtle, offering a stylish look for another decade. Zimmern also highlights the restaurant’s floor-to-ceiling windows where guests can see and be seen. Gaia boasts an extensive wine list with over 600 Italian and French wines, priced between HK$350 and HK$6,000. The Dining Room was created by the internationally acclaimed Japanese design house Super Potato, whose aim was to realize an exclusive and luxurious space with the feel of a private home. Such is the backdrop of the unique culinary experience available to members at this extraordinary restaurant. Prepared by one of Australian’s finest chefs, and enhanced by one of Hong Kong’s best wine cellars, every meal at The Dining Room is something to be savoured and long remembered. Mollie Ahlstrand is the chef and the executive owner of Trattoria Mollie in Santa Barbara, California. 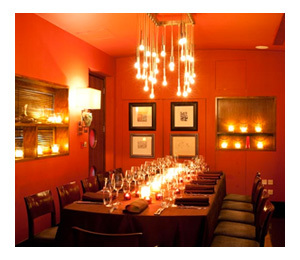 The charming restaurant serves Italian dishes made with talent and quality. 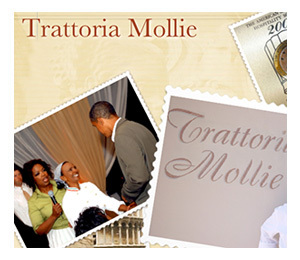 Chef Mollie has been featured on the Oprah’s Show and in “O” magazine. National Geographic Passport to the Best has recognized Trattoria Mollie as one of the “Ten Best Destination & Special Restaurants in the World”. In 2007 Trattoria Mollie was rewarded by the coveted five stars diamond awards, presented by the American Academy of Ospitality Sciences. Not surprisingly, the restaurant has attracted some famous fans, including Oprah Winfrey, John Cleese, Michael Douglas e Catherine Zeta-Jones. Mollie is glad to share her passion with visitors and those who comes to her restaurant. She wants that everyone who comes has a delightful and delicious experience. Her aim is to offer truly great food, lovingly prepared in a professional setting. Aurora’s premium international menu offers tempting delicacies for every meal. Popular favorites include the delicious Italian-inspired Sunday brunches with live pasta and carver stations and oven fresh pizzas. 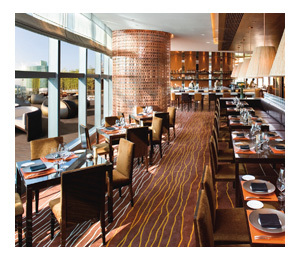 Aurora’s diverse range of dining environments ensures a different experience with every visit. 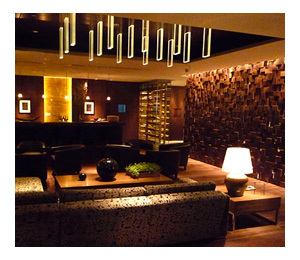 The wine lounge is one of Aurora’s most prominent features and is among the largest collections in Macau. Aurora’s wine range is on full display, in temperature-controlled custom built cellars that surround the restaurant’s dedicated wine lounge. With over 600 wines listed, its cellars cover every major region in Italy as well as an extensive choice of French and Portuguese wines which include the most coveted vintages including the vertical collection of Chateau Latour 1945 – 2005.